Playing with Papercrafting: Shut the Barn Door! And Happy New Year! Hi! How was your Christmas, everyone! Are you still partly tranquilized from eating turkey? You know, all the L-tryptophan your body has ingested with the turkey, which is needed to create serotonin, which in turn is needed to produce melatonin - the sleep enhancing hormone. In truth, this is more of a myth than fact, since turkey is no higher in L-tryptophan than chicken and we certainly don't notice the effect after a chicken bbq! But it's always a good excuse for a nap and to get out of Christmas dinner dishes!! I had a wonderful time on the island with my daughter Erin and her family. If I get home in time, I'll add a few photos, otherwise you'll see them later in the week. 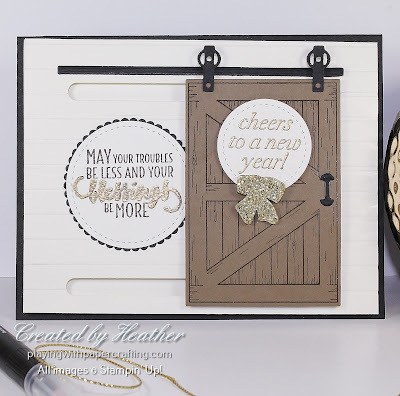 I wanted to share with you a multi-function card today: it's a New Year's Card, it gives you a sneak peek of a new bundle from the Occasions catalogue, it promotes a retiring bundle, and it is my FREE PHOTO TUTORIAL for my January Newsletter. You can subscribe to my FREE monthly newsletter by entering your email address in the box below and clicking on GO! The card features the new *Barn Door Bundle from the Occasions Catalogue and is it ever a cool set! Look at that hardware and the door handle. And it really does slide although the hardware is just for show and it's really a slider card mechanism that makes it work! 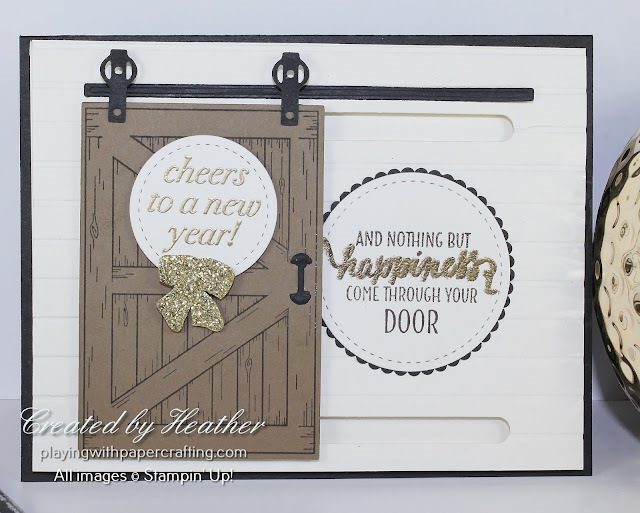 The texture on the Very Vanilla paper behind the barn door is embossed using the *Simple Stripes embossing folder, making it look like siding or panelling. so I add a stitched circle with a sentiment from Cheers to the Year stamp set, which is in the Holiday Catalogue and is retiring Jan. 2, to make it into a New Year's card. 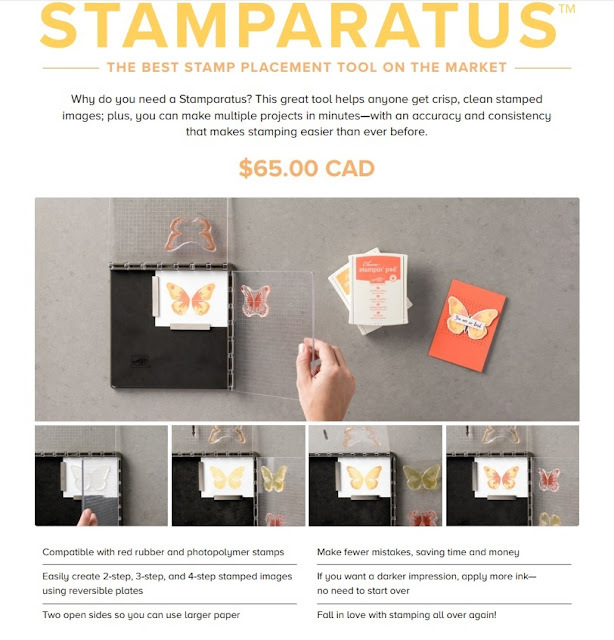 It was one of my favourites from the Holiday Catalogue and I got a lot of use out of it and if you think weddings, anniversaries, Canada Day, and winter birthdays, you could be using it a good portion of the year! Don't wait too long to get it though, because it's retiring and will no longer be available after Jan. 2. 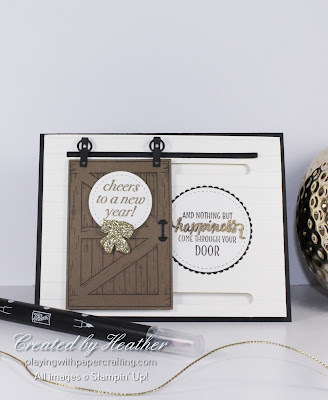 If you want to know how I got the single words on those "behind the door" sentiments embossed without masking anything, you'll definitely want to get the free photo tutorial. My photo tutorials feature clear step-by-step photo-enhanced directions plus a list of supplies and tools needed, including all measurements. I have a whole whack of them stored on my computer that I think should be doing someone some good, so starting in January, I will be making them available on this blogsite. Once a tutorial has been in my newsletter, I will wait 4 - 5 months before posting it on this blogsite so there is still an advantage to subscribing to the newsletter. It's almost over! Only 6 more days to get those products you had your eyes on in the Holiday catalogue before they are gone for good, so let me know if you want to place an order before the 31st of December. 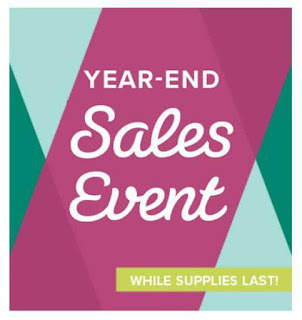 Only 5 more days to reserve yours! Go to my On-Line Store and click on Stamparatus to reserve!